I am in round two of reading books like “Goodnight Moon” by Margaret Wise Brown and Clement Hurd to my second kid. 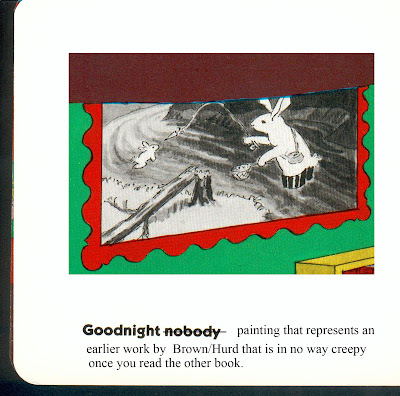 Way back in round one, I mentioned how a painting in “Goodnight Moon” that showed one rabbit fishing for another rabbit creeped me out. Later I found out that painting is from another book by Brown/Hurd. Creepy, yes, but I get it now. It is exactly what you see. 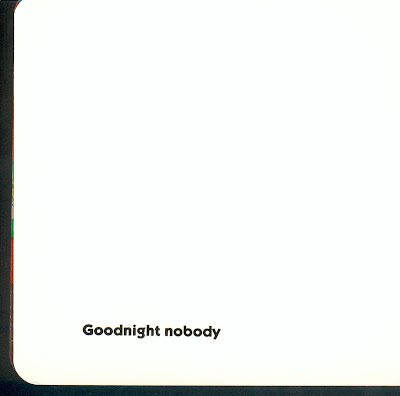 A blank page with “Goodnight nobody” at the bottom. 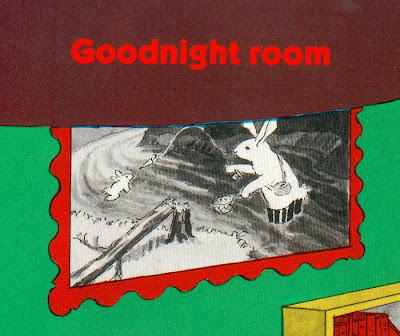 On the next page he says “Goodnight mush” and they show a picture of mush in a bowl. I never thought anything about it until I really started to look at the page for anything. A dot or a shadow or a hint of a wall. There’s NOBODY there. And that is really starting to freak me out because he doesn’t say “Goodnight nothing,” he says “nobody” which means no person. Which means that he might have thought someone was there or there was someone there a minute ago and now they are gone. Who were they? Is the old woman whispering hush killed by “nobody” three pages later? I could tear out that page, but it would really mess up the meter. I think the answer is for me to photoshop the earlier mentioned painting onto that page so that I can kill two birds with one stone: get rid of “nobody” and explain what that photo means.